Mobile payment services have swept across the African continent in the 12 years since the wireless carrier Safaricom launched M-Pesa in 2007. As of 2017, roughly half of the 282 mobile money services operating worldwide were in Sub-Saharan Africa, according to a McKinsey report. Nala’s founder estimates that there around 420 million Africans holding mobile money accounts, making the continent the leader in mobile money adoption by a wide margin. 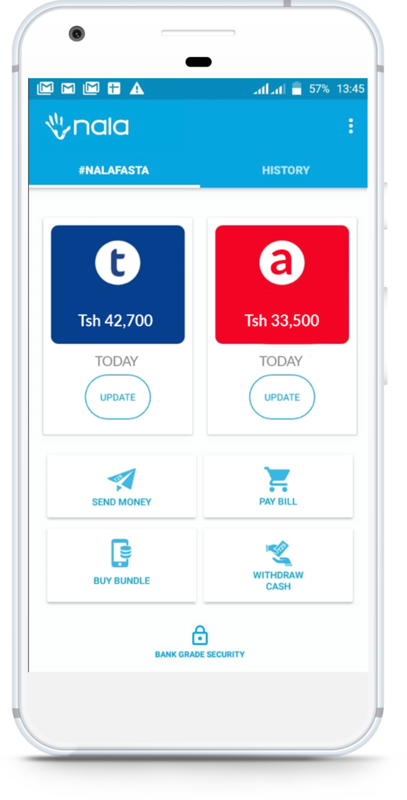 In Tanzania, making one send money payment requires a user to enter somewhere between 39-46 digits, a hard enough task for anyone, let alone someone who may be newly adjusting to mobile phone service. Using Nala, users can make payments to anyone on any device, and it only requires a one-time download to start transacting, according to the company. Think of Nala has taken all of the short codes from all of the transaction providers and created a router system that users can operate without having to memorize the different underlying coding. Currently live in Tanzania, with over 100,000 users, Fernandes says that his company has plans to expand to at least two other African countries over the course of 2019. It’s been a long road for Fernandes, a former national television host of youth talk shows and sports shows in Tanzania, to financial services entrepreneur. Fernandes moved to the U.S. for university, doing his undergrad degree at the evangelical Christian University of Northwestern in St. Paul. At the university, Fernandes developed an interest in economics and excelled. Encouraged by his business professor to apply to Harvard and Stanford for business school, Fernandes briefly returned home and did just that. He received a full ride to Stanford through the school’s Africa MBA Fellowship in 2014 and moved back to America. “I took the two years at Stanford to learn everything i can about fintech,” Fernandes recalled. “In the summer i started working at the Bill and Melinda Gates Foundation and that’s where i met Sam Castle. He was a PhD student at Washington doing research in mobile payments in MENA and Sub Saharan Africa. Castle and Fernandes stayed in touch while the Tanzanian wrapped up his studies at Stanford, and when Fernandes graduated and received the Frances and Arjay Miller Prize for Social Entrepreneurship along with its attendant $20,000 bounty, he returned home and started working on Nala. As he began working on different prototypes and as the work progressed, he was able to convince Castle to come on board. Now the company is generating some revenue from airtime sales and bill payments, although down the road Fernandes sees value in the data that the company collects across the multiple accounts that Nala services. Eventually there’s a possibility for the company to get into other financial services like lending and savings. What’s clear is the massive opportunity that exists in simplifying a transaction mechanism that’s wildly popular across the continent but also massively tricky for consumers to use. Mobile payments have already revolutionized financial transactions in Africa, by building a simpler interface, Nala could take that revolution one step further.